Who would believe it? Not even me if I wasn't self it with my own eyes! But the promise I made last week had come true and I've managed to write a blog post two weeks in a row. Well, this week was a lovely week at Cult (but isn't it always?) with something like 25 lovely people playing lovely board games. This week I played some more Orléans. It was still great. Justine and I drew for first place on points but she beat me on the tie break because she was further up the development track than me. 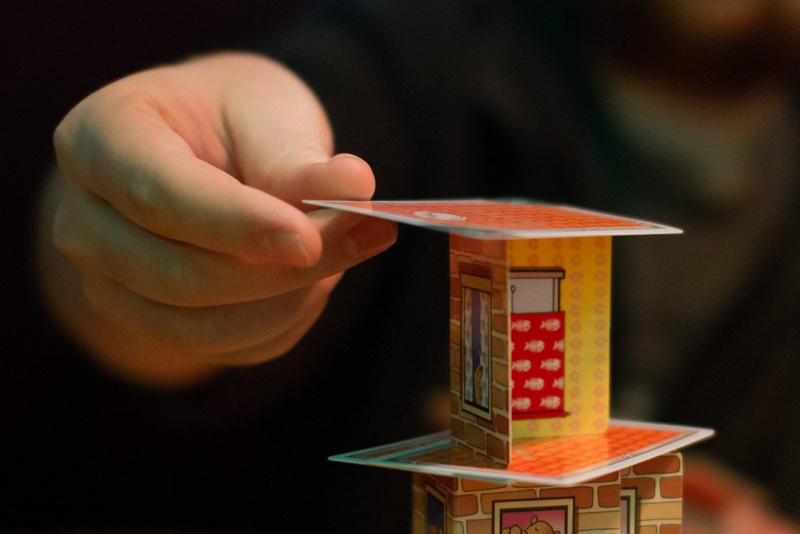 Afterwards we played Rhino Hero which is a kids game that is a short of mix of Jenga and Uno. Alex hated it. Mathew brought along Abandon Planet, a print and play he'd made of a Kickstarter project. Laminated and everything! Cath got in a play of the new game Grifters, set in the dystopian future of the Resistance and Coup. Small World made it's reappearance after a long time away, that used to be an IpBoG staple a couple of years ago. People also played, among other things, Concordia and, of course, Secret Hitler.